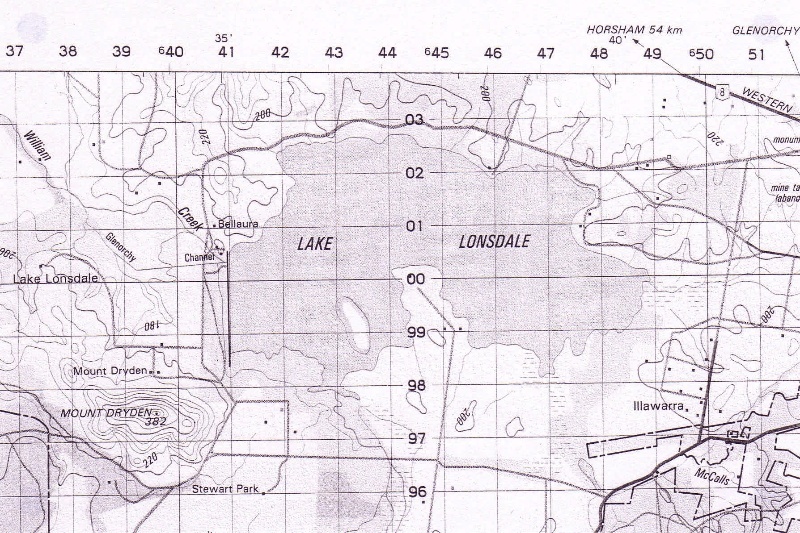 Lake Lonsdale was originally a swamp. As part of the Wimmera Mallee domestic and stock supply water system the swamp was converted into a storage basin known as Lake Lonsdale in 1903. Excavated between 1923 and 1929, the Charlton Channel, carried Lake Lonsdale water to the Wimmera plains. Lake Lonsdale, Ledcourt is historically and scientifically significant at a LOCAL level. It is associated with the Wimmera-Mallee stock and domestic water supply system which grew to become one of the largest of its kind in the world. Lake Lonsdale, Ledcourt is socially significant at a LOCAL level. It has been a district recreational destination and is valued and recognised by the local community and regional visitors. Overall, Lake Lonsdale, Ledcourt is significant at a LOCAL level. Lake Lonsdale is a large water storage south of Stawell and East of the Grampians. The Lake is in a generally flat open area of landscape surrounded by farming land. The storage basin has a long, straight dam wall on the west with a spillway into Mount William Creek. There is a picnic area below the spillway.